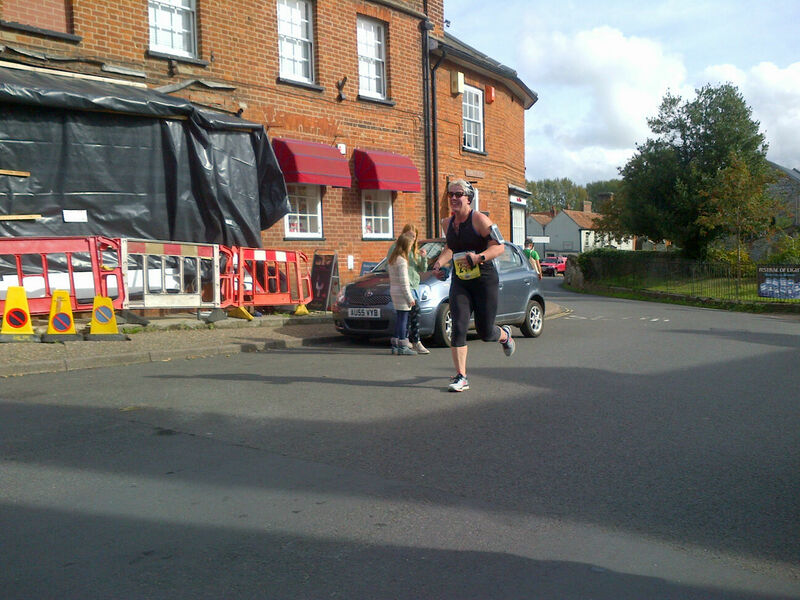 One day I will start a race story with the words “I was feeling well trained and confident”. Sadly this is not that day. 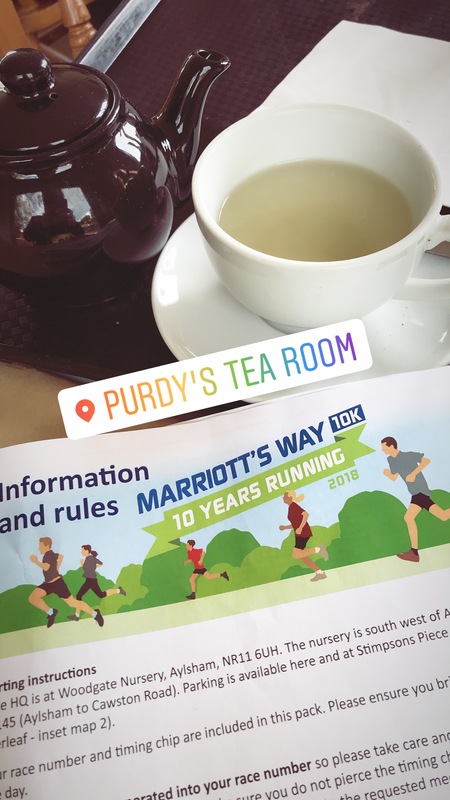 Marriott’s Way is my favourite 10k race to run. I’ve run it 3 times now. It was my first 10k back in 2012, then I ran it in 2013 and 2015. It’s lovely and flat, and the weather is (normally) lovely crisp and autumnal. It’s also famous, at least in my house, as the only time I have managed a sub 1 hour 10k back in 2013. The last couple of years it’s been at the start of Norwich Cocktail Week and we couldn’t manage it, or it sold out before we could get a spot. But this year we managed to grab a place for the runs 10th Anniversary race. 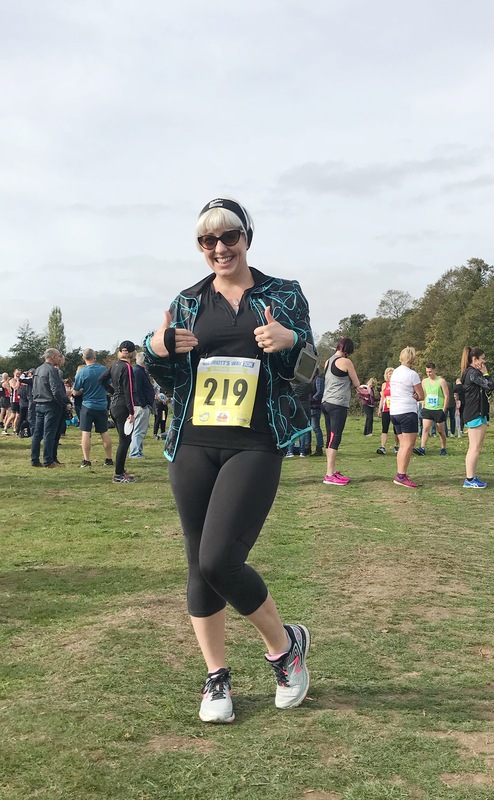 I was really looking forward to it, it would arrive just after a 2 week Roller Derby break after our Play Offs, and I thought I’d really be able to focus on training for it and getting back into running some distances while I was off Roller Derby. How I laugh when I look back at my optimism. On the 10th September I did a 4.5 mile training run. I was building my distances back up slowly, planned to take a couple of days off after Play Offs that weekend and get back to it with a vengeance in the middle of the following week. But Play Offs broke me SO badly, that I took a whole week off to recover and lick my wounds, then I got a horrible cold the following week, and all of a sudden it had been 3 weeks since I’d been for a run and the race was 5 days away. Figuring that a couple more runs probably wouldn’t help, I ended up lining up on a pleasantly warm but crisp autumnal Sunday to run 6.2 miles when I hadn’t been for a run at all for a whole month. No? Well actually what you can see in my eyes is the fact that in the car on the way over my left contact lens started to get this weird, gritty feeling, making my eye water like hell and I had no solutions and no glasses with which to sort it out. I was basically blind in my left eye before the race even started. I knew I had a good base level of fitness, so I knew I’d make it round. I just didn’t know in what sort of time. Would this be a floods of tears, complete disaster like Run Norwich? I also didn’t know how much it was going to hurt. As ever, the start of the Marriott’s Way 10k was a lovely and well-organised affair. 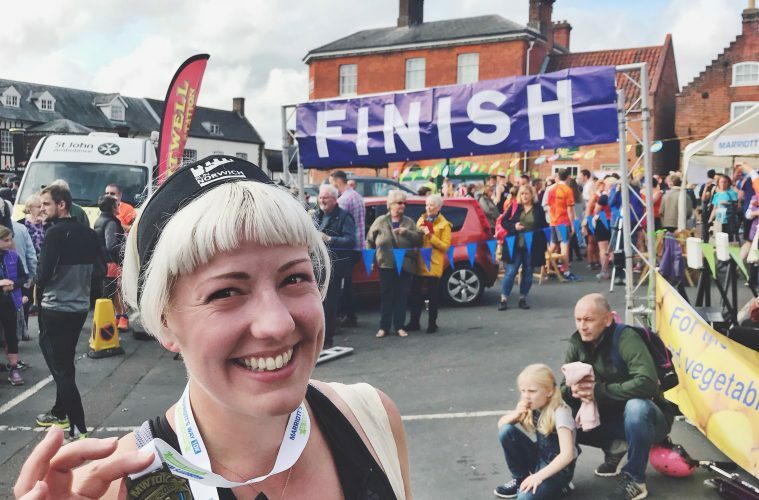 It’s a small race, and it’s point to point, so we parked in a carpark in Reepham, and hopped on the free shuttle bus to the start, which is at a Garden Centre in Aylsham. We picked up our race packs and popped into the Garden Centre for a nice civilised hot drink. Along with many other runners. The toilet queues were small, and the volunteers were friendly, and all in all there was a lovely atmosphere. The race starts in waves, the first lot of runners set off at 11am, and at 11:10 our wave crossed the start line and I waved Mr LLL off as he shot off at a far speedier pace than me. A tactic I often use is to find someone running at around the same pace as me and use them as a pacer, I basically stalk them for a few kilometres to keep me on pace. In the first few hundred metres I got stuck behind 3 women who were running 3 abreast across the path and chatting. This was a little frustrating as the trail is only one person wide and there is no overtaking room. They were running fractionally slower than I would have liked to be going, then one woman dropped back and the other 2 picked up pace and I thought “Hey, I’ll follow these guys”. about 100 metres further on I realised they were too fast for me as they shot off into the distance pony tails swinging in a fit and shiny way. So I decided to stalk someone else. I picked a lady with a pink water bottle and ran behind her for about 1k, until I decided I could go a little faster and picked another lady in a green top. Green top lady, you were an excellent pacer, thank you. I stayed with green top lady right up until the water station at 5k. Making pretty good time, not quite on for under an hour, but actually only a minute or so over, which surprised me greatly. Green top lady took a little longer at the water station than I did, so I headed off alone so as not to be too stalkery. At this point in the run the track is very narrow, and super speedy people from the wave that started after me kept zooming past forcing me to dodge round stinging nettles and bushes to get out of their way. With no one to pace me now I relied on my watch. By mile 4 I’m still feeling good and making good time for just over an hour. 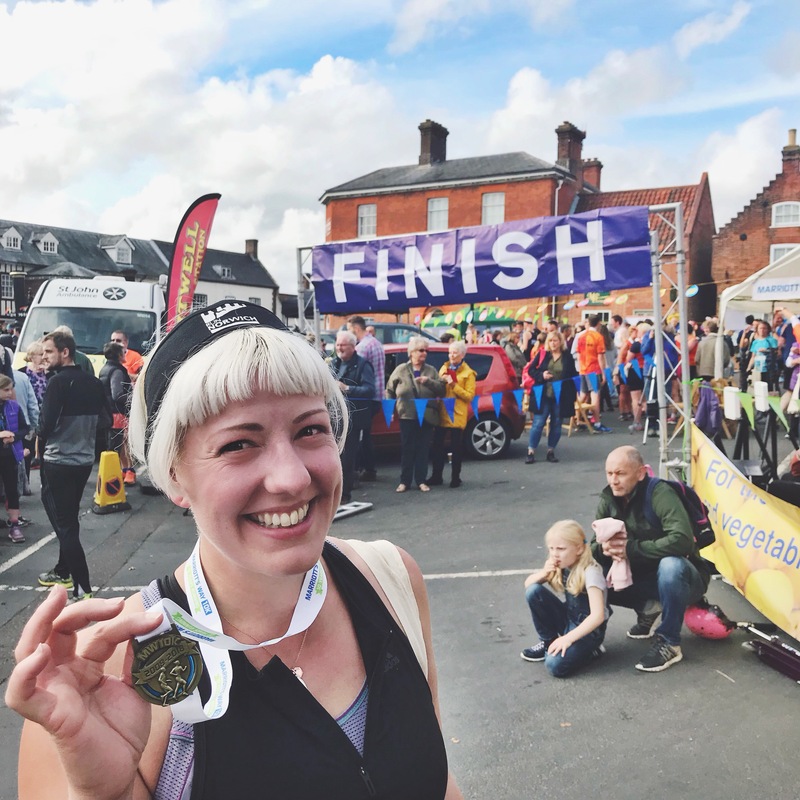 It’s important at this point to remember that the longest I’d run when I’d been working up to training for this event was 4.5 miles, because that might help explain why at about 4.8 miles my legs started to turn into useless lumps of lead. I could literally feel myself slowing down. I’ll never know how much I slowed down though, because just after 5 miles the battery on my watch ran out. *SOB*. So I ran alone, with no pacer, and no technology, on legs that barely wanted to lift off the floor. God job the scenery is nice. When I hit the 9k marker green top lady overtook me. It seemed she HAD trained for the distance and therefore hadn’t slowed down. I decided to try and chase her to pick up a bit of speed in that last kilometre. Most of this section is on roads as you head into the village of Reepham, and I made an all out effort to sprint up the hill into the village. Once I picked up my goodie bag and medal, my first priority was to find somewhere to sit down, before I fell down. My second priority was to locate Mr LLL, borrow a tissue, wipe my streaming eye and remove the contact lens which by now was causing me actual pain. After I’d dealt with all that. My third priority was to whinge about my watch, and go and look up my chip time, which was…..
That’s 1 hour 2 minutes and 19 seconds. Despite being all but blind in one eye, I was pretty impressed! My last Marriott’s Way was 1 hour 3 minutes 48 seconds. 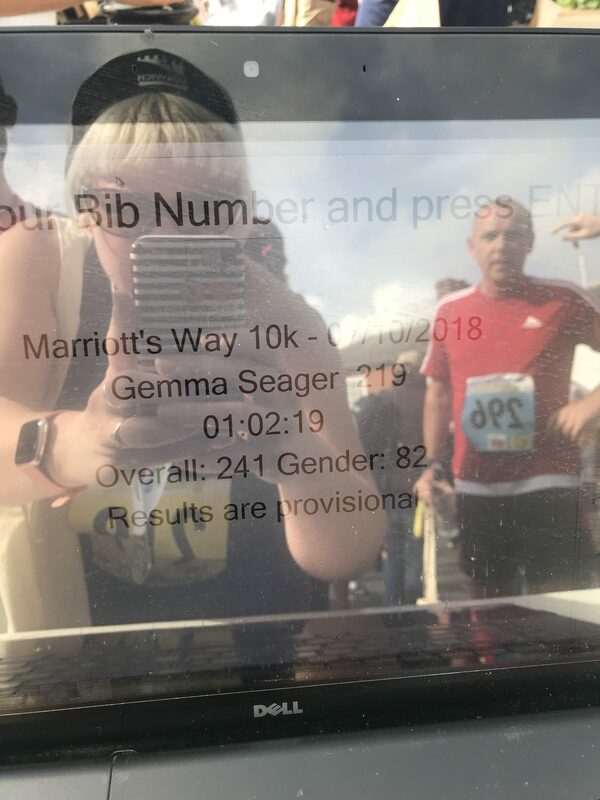 So whilst I might be some way off a PB, it’s not bad for someone who spent the last month napping and doing yoga instead of running. So, me, my medal, my banana, my dead watch and my squinty left eye headed off home to put some glasses on, charge up the watch and drink a celebratory beer. EDIT: So it turns out, that was gun time, not chip time. Which means according to the official results I actually ran it in 1 hour 1 minute and 54 seconds. Huzzah! Under 10 minute miles, which was my secret edited goal once I’d realised sub 1 hour just wasn’t happening! Well done. Quite jealous of the flat route. In Edinburgh all 5ks are up Arthur’s Seat, a bloody volcano. And all 10ks are up it twice!